The Checkbook Project pumps life into a classroom the way the stimulus package pumped bucks into GM. It improves test scores, inspires the entrepreneurial spirit, and even turns “thugs” into pussycats. Simply put, it’s a more complex form of “class money” without the bother of handing out Monopoly bucks (which often get lost and stolen). But it’s also much more. It’s a “real world” simulation, an economic infrastructure that promotes work ethic, practical math skills, and you guessed it, financial literacy. 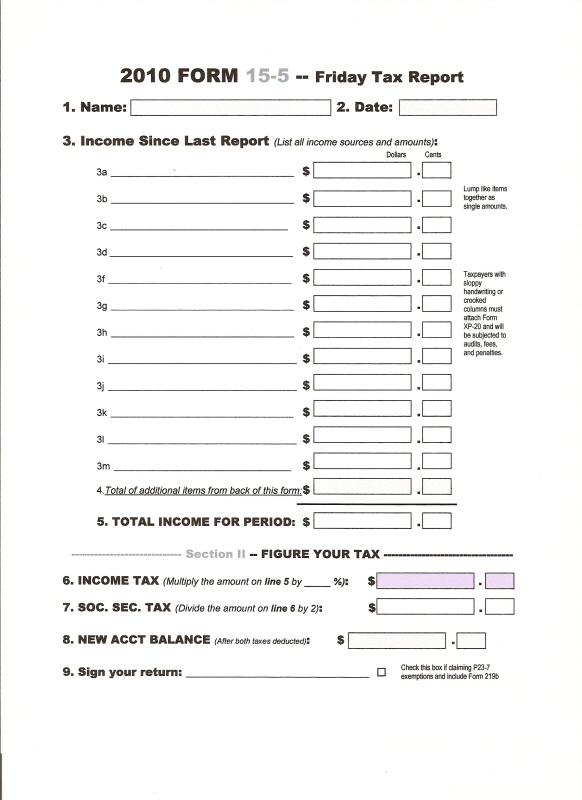 Five easy-to-read pages tell how to make it work, and it comes with a dozen FREE reproducible forms such as the tax report, table of credits and debits, desk purchase form, business license, job postings, and more (shown below). Take a look! Just click on the cover to download The Checkbook Project absolutely free. (Note: save ink–download but don’t print the cover.) Not convinced? Checkout this podcast interview about The Checkbook Project at Talking Fin Lit, a blog sponsored by McGraw-Hill. Need the forms to give your Checkbook Project that polished look? The reproducible forms listed below are available–currently for free. Why free? First of all we want you to encourage you to use Mackowiecki Lewis products. We feel positive that you’ll find this one so innovative and impacting that you’ll want to try Read-Aloud Plays, Fact Car Rally Race, Super Sentences, EZSubPlans, and all Mack’s other material. Secondly–and most importantly–we believe so strongly in the educational concepts reinforced by The Checkbook Project that we want to share it freely. Teach well, America! Provides a sample of a register page as completed by a student (in this case, a 4th grader). Use it on the overhead, document camera, or SmartBoard to teach students how to maintain their registers. 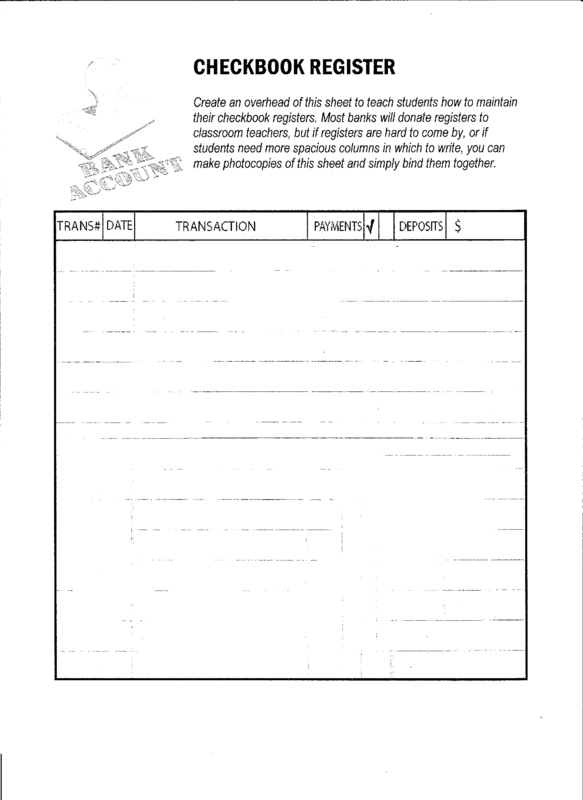 Provides a blank checkbook register page. Use it on the overhead, document camera, or SmartBoard to practice making register entries. It can also be printed in bulk and stapled together to create larger versions of the traditional register or in lieu of those provided by banks. To download a JPEG of the same page for easy upload to your interactive whiteboard, click here. This is where much of the math happens. It simulates the tax forms used by the government and provides the paper trail for the teacher to keep track of how students are doing with the project. A must have! For a JPEG of the same form, click here. 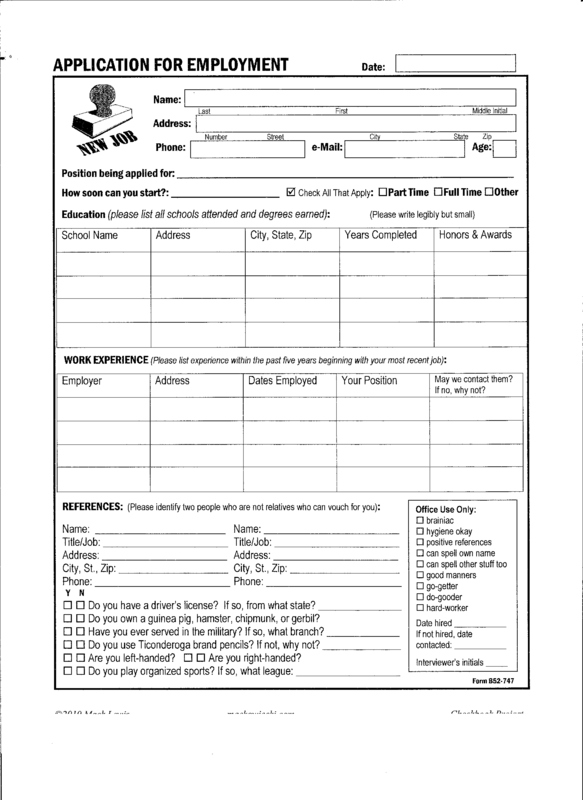 This form comes with a desk/cubbie rental agreement, a desk/cubbie purchase agreement, and a business license application. Using them simplifies your record-keeping. Each is meant to be filled out and posted in class. Click here for a JPEG of the same form. This form simulates “real world” aps used by fast food restaurants. Use it to hire students into classroom positions such as attendance monitor and teacher’s assistant. Click here for the same form in JPEG format. This set of “Employment Opportunities” provides postings for such jobs as teacher’s assistant, classroom custodian, homework manager, and others. Need it in Word for easy customization? E-mail us and we’ll see what we can do. This helpful chart provides payments plans for desk purchases. 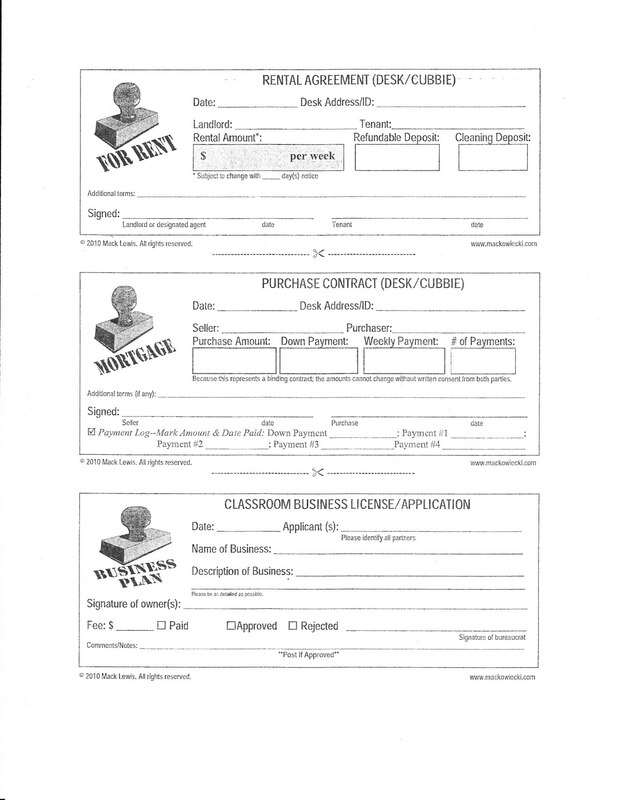 Post it in your room so students can make decisions about purchasing as opposed to renting. Coordinated with the Purchase Agreement. This handy dandy chart shows what to charge for what. Use it as a starting point to determines values in your classroom, or post it and make it the standard. Litterers, Loiterers, Tattlers, and other violators beware! Here’s a set of “traffic tickets” created by Oregon teacher and Checkbook Project user Shannon M. New as of March 2012. After trying out the Checkbook Project, if you have tips or ideas for improvement, let us know by leaving a comment below. Like any new program, the first weeks can be difficult for some kids. Here are eight things that will help: 1. Be sure to post, model, and review the blank checkbook register daily during the first week or two. 2. Introduce elements of the project gradually (For example, wait until week two to begin renting desks, week three to begin renting cubbies, week four to issue business licenses, and even later to hire for the classroom positions). 3. Keep the debits and credits simple (whole dollar amounts and fewer items). That will make the first couple of tax reports easier. 4. Have extra help on hand for the first two tax reports, allow extra time, and be sure to post and model the tax report form. 5. Limit the Checkbook Project to about one-third of the year. 6. Don’t over-complicate student accountability. I have kids turn their checkbooks in on Friday, at which time I record their ending balance, and I “audit” one or two students per week whose registers looks questionable. 7. Allow for lengthier sessions with extra adult help for the first couple of tax reports and when you rent and purchase desks for the first time. 8. Have fun with it. Watch for those teachable moments, don’t be afraid to it evolve naturally, and adapt it as necessary so that it works for you and your kids. © 2010 by Mack Lewis. All Rights Reserved. The original purchaser–or in this case, the person physically downloading these temporarily no-fee materials–are free to reproduce them for work within their own classroom or teaching assignment. This is absolutely fabulous! I teach a high school life skills course, and this will be a fun way to engage my students in the financial skills they need. Thank you so much for sharing this!